This is Part 10 of Esther Hyams’ wonderful series of poems telling the story of Anne Boleyn’s life. To publicly present the Lady Anne to the world in an elegant dance. Francois approved of Henry’s plans giving him and his Lady such hope. 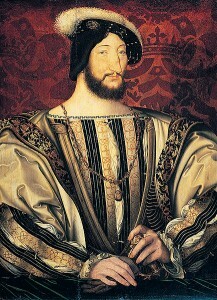 Jean du Bellay had to get his French King to invite the graceful Madame Anne. It was delicate, as what was Anne’s status? Henry’s wife, yet she was not. And the French Queen was Catherine’s niece, not to be forgot. But the absence of the new French Queen would cause no great distress. There were delicate betrothals to be controlled and fanned. The Lady Anne was now his wife in everything but name. The Lady Anne Rochford would be made a Marquess in her own right. Verrrry beautiful poem. I rarley do this: read a poem, then must read it aloud. That’s how this one affected me, Honour. (My cat, Feather, squeezed her eyes in appreciation of the rhythm. )And how special is Bobbb’s comment?